Though there is evidence of attempts at dental treatments as far back as 70000 B.C., the first known recorded description related to dentistry doesn’t occur until around 5000 B.C., when a Sumerian text describes “tooth worms” as the cause of dental decay. The tooth worm theory was widely accepted for quite a long time (it wasn’t proven false until the 1700s!). The theory was that a worm infected a tooth and ate holes through it from the inside out. Based on the knowledge of the time, this wasn’t a particularly unreasonable idea, considering the fact that cavities can resemble holes dug by worms. The Mayans are considered masters of primitive cosmetic dentistry. But rather than focusing on straighter, whiter teeth as we do today, the Mayans used precious stones and gems to decorate teeth. They would carve and chip holes into the enamel of the teeth, and place the gems into these holes, affixing them with plant sap, crushed bones, or other fixatives. 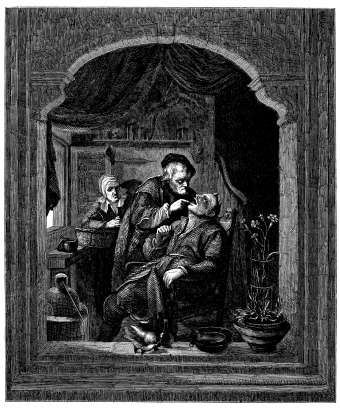 In ancient times and through to the middle ages, there really wasn’t such a thing as a dentist. Most dental procedures were actually preformed by a barber. The “barber surgeon” was one of the most common medical practitioners in medieval Europe. Most surgical procedures were performed by them rather than by doctors, by dint of the fact that they had the sharp metal tools necessary to do the job. Indeed, in the European Middle Ages, barbers were expected to do everything from giving people haircuts to amputating limbs – and performing dental surgery. In 1530, the very first book specifically devoted to dentistry was written: The Little Medicinal Book of All Kinds of Diseases and Infirmities of the Teeth. From around this time on, dentistry began the transition to a recognized medical specialty. In 1723, French Physician Pierre Fauchard, who is considered to be the father of modern dentistry, published his influential book The Surgeon Dentist, a Treatise on Teeth, which for the very first time defined a comprehensive system for caring for teeth and treating dental ailments. Fauchard also introduced the idea of dental fillings and the use of dental prosthetics, and identified acids from sugar as the cause of tooth decay. In short, it was a ground breaking book! 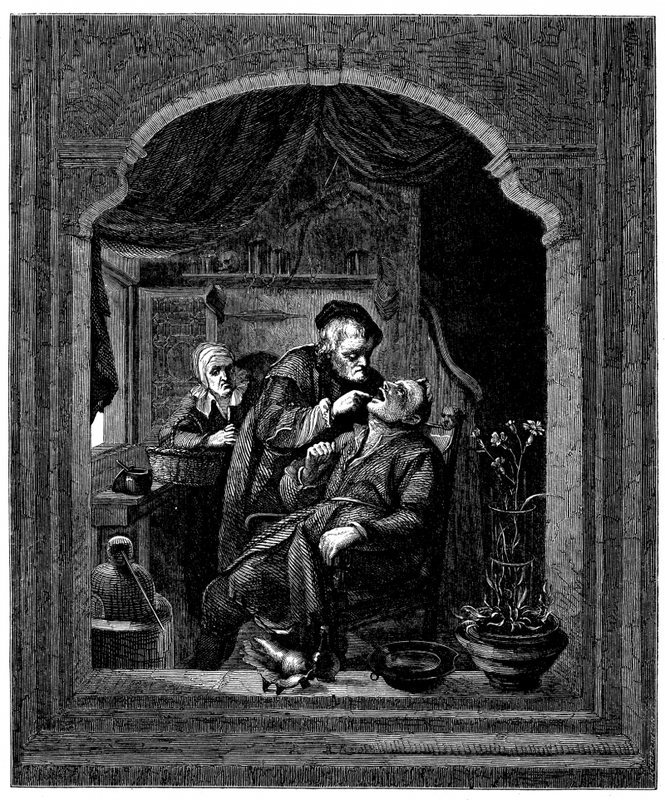 In 1840, the Baltimore College of Dental Surgery opened as the first institution of its kind, with the aim of enacting more regulation and oversight in the field of dentistry. In 1841, the State of Alabama enacted the first dental practice act in the world, and about 20 years after that, the American Dental Association (ADA) was born. The first university-affiliated dental institution, the Harvard University Dental School, was founded in 1867. By the 1870s, a little soap, starch and candle company called Colgate had started selling the very first mass-produced toothpaste and toothbrushes, and you probably have some idea of whether or not this venture was successful for them! Edward H. Angle, who started the first school of orthodontics in 1901, created a simple classification for crooked teeth in the late 1800s, a system still in use today. Americans in general did not adopt good teeth brushing habits until after World War II, when soliders stationed abroad came back and brought the concept of good oral health with them. Though much of the history of dentistry was painful (and frankly terrifying), we owe these early explorations into dental health for the quality dental care we are able to provide today. So next time you visit our Vancouver dental office, you may want to thank your lucky stars that you’re not paying a visit to the “barber surgeon” instead!